A 4 minute video clip from mother’s visit to the Dacus grocery store during the 1985 homecoming. 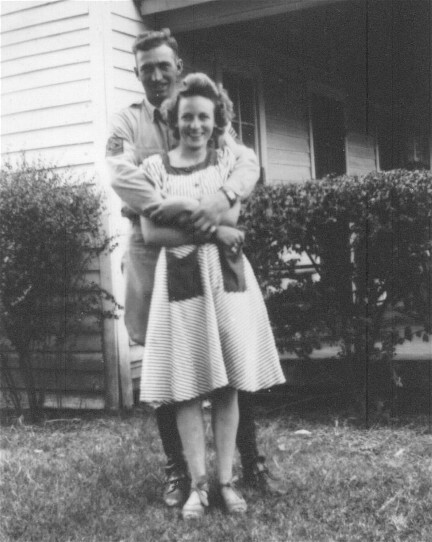 Buddy & Wanda grew up with our mother & Buddy talked about the first time he met our father in 1943 soon after our parents were married. Our mother Eda Faye Thomasson was the daughter of Gordon & Hester Thomason & married Donald McKinney, a cowboy from Wyoming, while both were stationed with the military at Fort Riley, Kansas. 1943: Donald & Eda Faye (Thomasson) McKinney visit her parents in Magazine, Arkansas after their marriage.